It is Spring Eve, she said to all the Doubts. Gather around! All of you. they congregated at the hem of her garment. Gather around! All of you! and you too, yes you! Mediocrity. Cynicism. and Just Joking. And you! Unwilling to change. Unwilling to look. Unwilling to see what is needed. It is Spring Eve, and you all know what that means. to choose differently and to overcome. And for this, I thank you. Old Patterns! Come! and Not Enough! Come! With a swirl of dust they came in. This is how people feel when you are all in the room! The rooms of their hearts and minds! They cannot even hear themselves think. Hearing my voice is even harder. Because you are all so demanding. My Children try everything to quiet you. television and escapism of very kind. and the uncertainty of all things. But it is their job to do the work! shouted Blame. They have too much baggage to get started, quipped Non-Action. They cannot do it! exclaimed Fear. Whatever, muttered Mediocrity, with a shrug. I’m not going anywhere, said Old Patterns nonchalantly. that you are not in charge. At all. Those gathered began to cower. dedicated to the SPIRIT of HOPE. presided over by the POWER of LOVE. Those gathered began to dissolve. And then she released her decree. the way of being that enables us to live the most vital life. to all patterns of thinking that do not serve. will inform us about the highest good of all. in the middle of her kitchen floor. into her solid gold dustpan. she blew the contents out the window. and spiraled into the cosmos. She called that configuration What Was. And she set the Seven Sisters to watch over them. her silver cat, Jupiter curled at her feet. And she meditated upon What Was To Come. She knew that Creativity would do the trick. It always does. She mused. whose activity, when tended, will light the path. to do this creative work of Banishing the Doubts. to our own inner resources and reasoning. Then the choices we make are empowering. no matter what one calls them-that distract, and accuse. We must learn to banish them. We must learn to practice wellness as a way of being. and to provide them the tools to do the work with me. Tools like Faith. Practice. Wisdom. Study. Art Making. Song and Dance. Hope and Creativity. and with the joy of yet New Life. in the physical and spiritual lives of her other children. So much left to be resolved. So much that just cannot be explained or understood. Still, New Life continues and flourishes. That is what her Son brings. Resurrection of the body and spirt. Life is filled with them mystery of how it works together for good. Death and New Life. Side by side. Sorrow and Joy. Despair and Hope. that New Life is possible! it is happening every second. She walks into her garden – smelling dew and dawn. Daffodil, Narcissus, Hyacinth, Red Rose, Lily, ah, the Star Gazer. through the cherry blossoms and cast light on her hands. appreciating them for all their handiwork. That white robin flies to her window sill, and watches her. She raises her arms and opens her palms to the sky. Her heart flame illuminates the dawn. She lifts up her voice. COME All YE FAITHFUL! COME HEALING! COME BLESSINGS! COME NEW LIFE! the tulips poke up their heads. Birds begin their chorus of song. Whales send up flurries of sea water. She calls into the gold pink morning light. And she feels that all is well. she pour his cup of coffee. Good Morning My Beloved! Happy Spring! They smile and kiss one another. She puts honey and cream in the big white mug of coffee. We have such a busy Holy week ahead! The whole kitchen and the whole earth, and you, are glowing! I can see that you have already gotten us off to a mighty start! Oh yes, she replies, smiling. Oh yes. I share this writing with you each Spring. And today is bright SPRING Equinox I breathe a sigh of relief that we are heading into the light. A dark passage of the soul is work we all must do and today, yes today I am ready to find my way to the light. Willing to extend my heart into my future. Ready to connect my hope to yours and to all beings. This week on March 25 we also celebrate the Feast of Our Lady of the Annunciation – a time of yearning and yes. Over on the Red Madonna, 85 women are painting and writing this theme into their work…and as each of us explores for ourselves that which we are saying yes to… I ask you now. What are you saying yes to? I am saying yes to joy again. 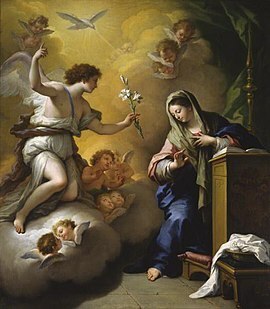 Annunciation by Paolo de Matteis, 1712. The white lily in the angel’s hand is symbolic of Mary’s purity  in Marian art. The Annunciation (anglicised from the Latin Vulgate Luke 1:36-39 section title: Annuntiatio nativitatis Christi), also referred to as the Annunciation to the Blessed Virgin Mary or Annunciation of the Lord, is the Christian celebration of the announcement by the angel Gabriel to Virgin Mary, that she would conceive and become the mother of Jesus the Son of God. Gabriel told Mary to name her son Jesus, meaning “Savior”. Many Christians observe this event with the Feast of the Annunciation on 25 March, nine full months before Christmas. According to Luke 1:26, the Annunciation to Mary occurred “in the sixth month” of Elisabeth’s pregnancy with the child later called John the Baptist. Approximating the northern vernal equinox, the date of the Annunciation also marked the New Year in many places, including England, where it is called Lady Day. Both the Roman Catholic and Eastern Orthodox Churches hold that the Annunciation took place at Nazareth, but differ as to the precise location. The Church of the Annunciation marks the site preferred by the former, while the Greek Orthodox Church of the Annunciation marks that preferred by the latter. The Annunciation has been a key topic in Christian art in general, as well as in Roman Catholic Marian art, particularly during the Middle Ages and Renaissance. ← Activate Your VISIONARY WOMAN – yes right now. What a wonderfull expresion of celebration and hope for the spring, thankyou for sharing your light with us ! What a lovely expression of hope and celebration for Spring! Thank you for sharing your light with us!